Luggage on wheels was a major advance in airport survival, but as we pack more stuff into our bags, even the wheeled ones are getting to be a bit of a burden to drag around. 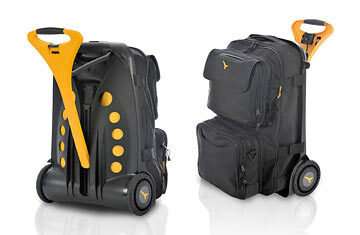 British luggage purveyor Live Luggage has solved the problem with its line of power-wheel bags. The Hybrid PA bag monitors how hard you're working to pull the bag and provides enough power to the wheels to make your effort unnecessary. Also, its antigravity handle is designed to put 85% of the weight on top of the wheels, so it feels like you're pulling a bag of cheese puffs instead of whatever it is that you're toting. Once you're onboard the aircraft, another helpful feature kicks in: two outer bags can be zipped off and easily fit in the overhead bins.